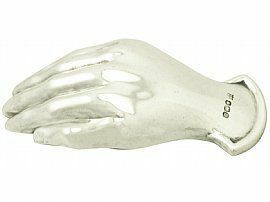 Caddy spoons are pieces of flatware which have the privilege of being held in high regard as a symbol of prosperity and wealth- being from a bygone era where it was necessary to use a precious, hand crafted piece of silver as a spoon to measure out your tea! 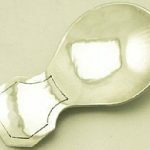 The notable difference in the shape of the caddy spoon is its shorter handle and a shallow bowl, in comparison to those used for stirring or eating with. The shorter handle is so that the spoon itself can usefully be stored in a tea caddy; and purpose of the shallow bowl is so the owner can easily measure out the perfect amount of tea leaves to achieve the perfect taste. 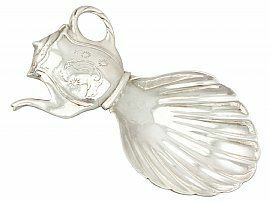 A caddy spoon often features intricate detailing and naturalistic themes, as was favoured during the regency period when the popularity of caddy spoons surged, due to the increase in trade and the importing of tea. Tea was once only for the richest members of society, and has been used across the world in moments of ritual and reverence for centuries. It was therefore a luxury to indulge in, and for that opulence – no ordinary spoon would do! 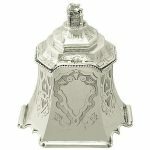 Sterling silver caddy spoons were preferable, as a cheaper material may taint the taste of the precious tea. Over time the traditional tea caddy design developed forming a necessity for an implement to scoop out the tea leaves. This led to the creation of the caddy spoon. The earliest examples found during the 1760s were rather different in terms of design to the current caddy spoon, as they were longer in the handle and could probably be described as long handled ladles. The need for a shorter handle soon became apparent and the short handled caddy spoon arrived in England in the 1770s. The reason behind this major design change was so the caddy spoon,as mentioned earlier, could be stored neatly inside the tea caddy (or box) and therefore wouldn’t need to be removed or lost. 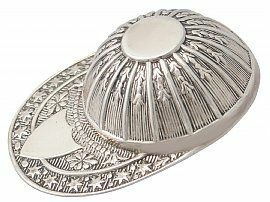 Caddy spoons come in many styles, during the late Georgian era they were predominantly shaped to mimic a scallop shell, it is believed that this is because the earliest tea was shipped along with scallop shells as a means for the traders to scoop and sample the tea during transit or for potential merchants examine the tea at the docks before purchasing. Later, more decorative and intricate design motifs emerged- such as flowers and birds- alongside more elaborate handle materials like bone and mother of pearl. 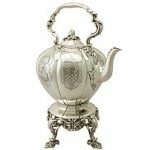 Silversmiths and goldsmiths also caught on to this rising trend and saw a chance to produce a new item of teaware which would both be useful but also allowed them to get creative with their designs. 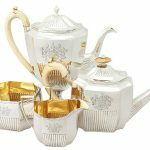 Many associate tea accessories with the English, in addition to North America, was also heavily attached to collectable teawares, incorporating caddy spoons and sugar tongs in comprehensive silver tea services. Novelty caddy spoons soon made an arrival in the 1800s and would include caddy spoons in the form of jockey caps, acorns, thistles, fish, shovels to name a few. Novelty caddy spoons have maintained their popularity through time, as an antiquity they are unique in the sense that they hold status almost of an object de curiosité – their purpose isn’t immediately clear unless you’re sufficiently cultured enough to know about caddy spoons! 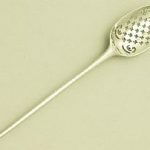 As the price of tea declined the tea caddy had become a more ordinary and commonplace product, due to this fact it also meant the caddy spoon was crafted from cheaper materials than silver or silver plate. What truly added to the demise of the caddy spoon was and arrival of the teabag. Teabags began to replace loose tea in many kitchens and therefore the need for a device to collect the loose tea was deemed no longer needed. For those who still use loose tea the caddy spoon is still a must have as the spoon holds the correct amount (2 1/2 g) of tea leaves. You can get modern caddy spoon however they are difficult to find. 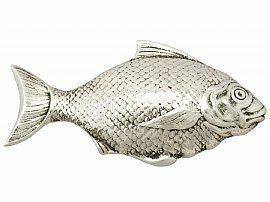 Currently at AC Silver we are able to offer our customers a variety of novelty caddy spoons, with the designs ranging from intricate fish, hands and scallop shells to teapots. Not to exclude one of the most famous of the novelty spoons produced from this period- the Jockey Cap. We are fortunate to currently have a ‘jockey cap‘ caddy spoon, based on an original George III jockey cap style caddy spoon.